District 6040 Annual Fund Chair DGND David McCaughey is pleased to announce that, once again, Rotary Foundation recognition points are available to match unrestricted cash contributions to The Rotary Foundation’s Annual Fund-SHARE. 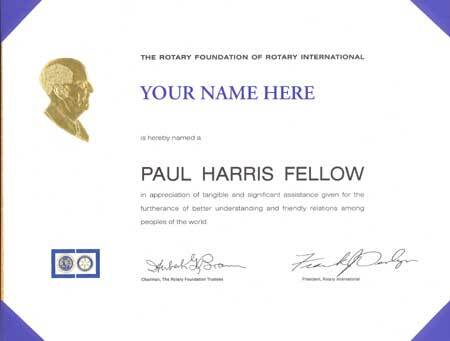 This is a great opportunity for Rotarians to become new Paul Harris Fellows. Do take advantage of this generous donation and support the wonderful work of Rotary International. The Annual Programs Fund (APF) is the lifeblood of our Foundation. Contributions to APF give strength to our programs each year because they carry the "brand identity" of Rotarians. That is, our Rotary Foundation's programs are identified by Rotarians, supported by Rotarian contributions and administered by Rotarians. The Rotary Foundation is YOU! It is our "Every Rotarian, Every Year" contributions to the APF that support all of our educational and humanitarian programs. The Foundation's good works in the world are only limited by our imagination, actions and contributions. Become a Paul Harris Fellow sooner with matching points for your donation! Become a Paul Harris Fellow. Earn a new Multiple Paul Harris Fellow pin. Make your spouse a Paul Harris Fellow and your children, too. How about your parents, grandparents, grandchildren, favorite neighbor, or your boss? NEW Paul Harris Fellows. We'll match your personal donation of $100 or more, to the Annual Fund of our Rotary Foundation. NEW Paul Harris Society Members. We'll Double your personal donation of $100 or more, to the Annual Fund of our Rotary Foundation. NEW enrollment in Rotary Direct. We are also offering matching points for a NEW enrollment in Rotary Direct—the method for donating via periodic credit card deductions. This offer begins August 27th and expires on December 1st, 2018. David is happy to assist with any questions. Please give him a call or email him.